This month I embark on a journey that I have never been on. A journey from which I may not return. A journey that will take me to places both high and low. A journey that will fill me with wonder and dread. A journey that will expand my horizons, raise my expectations and lower my overall fat content! I will eat no processed foods for the month of October! And possibly beyond. . .
Now, eating foods that are not heavily processed is not a stretch for me. Unprocessed foods are food the way nature made them. Simple as that. I rarely buy processed foods, but I do buy some. Skippy Peanut butter in the giant Costo jar is always in the pantry. Campbell’s concentrated Cream of Tomato soup is my mother’s favorite and will also remain in the pantry. And yes, Ruby has the occasional Happy Meal. (oh the horror!) But my recipes are mainly from scratch, although I have no problem using a good quality jarred tomato sauce or low sodium chicken broth when cooking. These are products that save time and I always have on hand for cooking emergencies. I generally do my everyday grocery shopping at Trader’s Joes and Sprouts (I call it the ordinary persons Whole Foods) which only sell foods without a lot of additives, preservatives and the like. Sprouts has great bulk bins, where I buy everything from sea salt to unbleached flour to steel cut oats. And the occasional bag of sour gummy worms for the kid. The meats tend to be naturally raised, hormone free, and/or organic. I have even bought a cow! Well, part of a cow. Two of my blogging buddies. Andrew Wilder, who is the man behind the whole #unprocessed movement, and Dorothy Reinhold of Shockingly Delicious and I bought 1/8 of a cow! 1/8 you scoff! Have you ever seen the size of a beef cow? Well, 1/8 is a lot of cow! We all had a lot of wonderful, grass fed, all natural, delicious beef to enjoy. It tasted like the beef I ate when I was a kid. And three years later, here I and thousands of others are. Ready to embark on our journeys. I cannot say I won’t wander off my path a bit, but I’ll look at my map and get back on the right track. I am not forcing my mother and daughter participate, although because I am the cook in the family they will be eating mostly unprocessed foods anyway. But at 81 years old and 14 years into her lung cancer battle, whatever mom wants to eat, mom gets to eat. She eats like a bird now, and this is a woman used to eat like a linebacker! Though her body may not be able to eat as much, in her dreams she still eats very well! She tells me of the foods she dreamt of, much of it from her childhood. Like canned figs. I don’t think I’ve ever seen a canned fig. If you know where to get canned figs please tell me so I can buy her some! If mom tells me to make her a sandwich with American cheese on Wonder bread with extra Miracle Whip, she’s going to get it. With a smile! My daughter is actually a great eater for a five year old. She loves salads, vegetables, fruits, fish, chicken, turkey, pork and snacks on roasted seaweed. But she LOVES Happy Meals, Nacho Cheese Doritos, Scooby Snack Fruit Treats and other very processed foods. For my own sanity (and there is not a whole lot left, believe me) she will not be on the full unprocessed program either. I am hoping this will help with my migraines also. By eliminating different food I may eliminate migraine triggers. By adding other foods I may find triggers. I do know it will help me to stay away from junk food with no redeeming value, except that it tastes good. And when I am stressed out, it tastes even better. I hope you will consider joining me and take the pledge to eat unprocessed foods, the way we were meant to. Here is my first #unprocessed breakfast, that can even be made the night before. 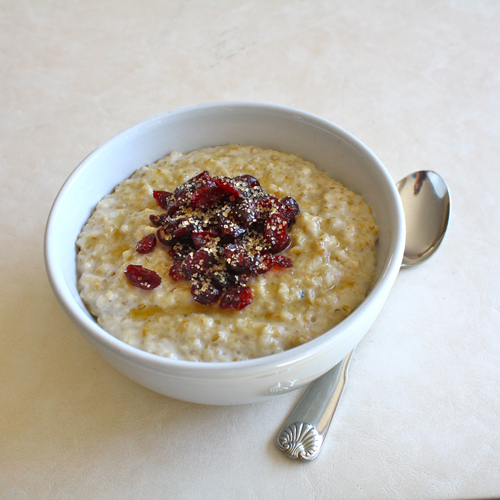 I like to garnish my oatmeal with dried cranberries, diced apples, diced fresh peaches when in season, almonds or raisins. Almost any dried or fresh fruit can be added to oatmeal. I sweeten it with maple syrup, though I realized I was out of maple syrup when I made this today, so I sprinkled it with raw cane sugar instead. Whatever you choose, enjoy it. Slowly stir in the oats, then lower the heat. Stirring occasionally, let the oats cook for about 15 minutes, until most of the liquid is absorbed. Add the milk and vanilla, and continue to cook and stir another 10-12 minutes, until the oatmeal is thickened and creamy. If you are making them the night before, just follow the recipe the same. Let them cool, then refrigerate them overnight. To reheat, add some milk or water to loosen them, then reheat in the microwave or on the stove until hot. You can either do a portion size or reheat the entire batch in that way. So how would you make these the night before?? I have had a bag of steel cut oat for awhile, but lost the recipe that I was going to use them for. I do like oatmeal and would love to use this ingredient. Lois, here is a great explanation of the differences in oats, taken from the website http://cancerdietitian.com. Steel-cut oats are the whole oat kernel, which is cut into two or three pieces using steel discs. They are a better source of fiber than rolled oats, but take longer to cook. Rolled oats have the bran mostly removed and are rolled flat to make them easier to cook. With the bran removed, they have less fiber than steel-cut oats. Quick-cooking and instant oats are rolled oats that have been cut into smaller pieces and rolled thinner, thus cook quickly. They are an easy source for preparing many oatmeal dishes. Guess I’ll go on Amazon and see about those canned figs! Thanks for all the information Dave! I’ll ask mom if this might work. Since it’s a jam rather than a preserve, it won’t have the whole fruit, like I (and perhaps your mother) remember, but the flavor may get her there. Umm this oatmeal looks great. I haven’t had oatmeal in a while and I think its time I make this! Cheryl, Best of luck to you w/the non-processed diet in October. You’re so motivated and do so much on your own already that i think you’ll be very successful. Please keep us posted re your journey! 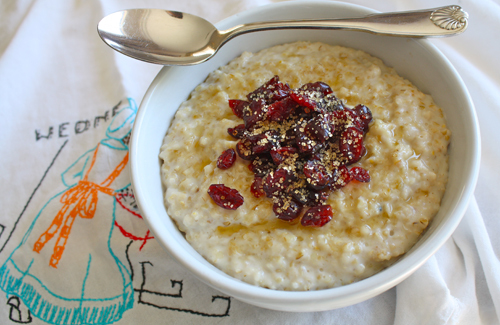 As a result of this blog I shall visit Sprouts, and make some Vanilla Steel Cut Oats. How did the oats get that name? the dish looks delicioso! Cheryl, welcome aboard! I want to encourage you to stick with it. I haven’t had a migraine in more than five years, since I gave up sugar and processed food.